Intrigued? Writer/director Megan Kelly and producer/actor Kate Grabau talk about their twist on Shakespeare’s classic comedy and their new company. Much Ado About Something arose from a discussion Kate and I had over coffee back at the first of the year. We had always wanted to work together; we loved Shakespeare; and the previous year, in an especially busy moment, I had said I wanted to direct her in As You Like It, at some point. So over coffee, Kate called me out. “Let’s do it for the Fringe this year.” And I laughed, and nodded, and pretended to agree to it. And I kept pretending, so much so that I found myself saying, “As You Like It is too hard. 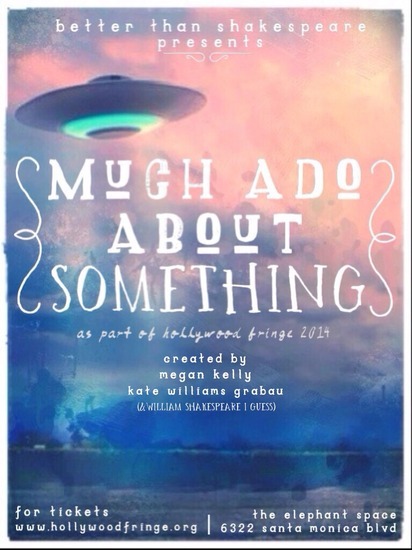 What about Much Ado?” Pretty immediately – and both of us still pretending at this point – the discussion turned to how to make Shakespeare Fringe appropriate. We wouldn’t have very much money. Shakespeare is always done. Much Ado is always done. What could we offer a Fringe audience? We played around with the title. If all these romantic shenanigans were Nothing, wouldn’t it be funny if Something was actually going on in the background. My brilliant first idea was that the house was on fire. Not a sustainable or interesting option, but the sentiment stuck. What is the fire? Who is the Chicken Little? That’s what Much Ado About Something is. Chicken Little, with aliens. While Claudio woos Hero, Beatrice and Benedick argue, and Don John schemes, aliens infiltrate, transform, and enslave citizens of Messina. And only the Messenger knows it, but no one will listen to him – he’s just the Messenger! The story preceded the theatre company. We created the Better than Shakespeare! Theatre Company, and enlisted some of our most talented friends to create a collaborative space to figure out how best to tell this story. What we’ve achieved is something pretty silly – part homage to mid-century alien invasion B-movies, part Shakespeare in-joke, part whatever makes us laugh., part one wild instrument called a Theremin. So the show is for audience members who want to play along, who like Shakespeare characters at their stupidest and most outlandish and self-involved, or who want an easy (and inaccurate) introduction to Much Ado. The whole thing feels very Shakespeare-y to us. He liked his wild subplot, his secret take-over, his large-scale war. But we’re really just doing the show for the fun of it, and hope people come for the fun of it. After we realized that our joke had somehow gained enough steam to become a production, it became important to me to develop a set of core values. When we were initially talking about Much Ado, we were focusing on the character of Beatrice: witty, intelligent, independent. In an Elizabethan counter cultural twist, she does not define herself by the love or attention of a man. Marriage isn’t her main objective, and it is not love for a man, but love for her cousin that is her driving force. She is, without a doubt, one of Shakespeare’s best female characters. Hero, on the other hand, doesn’t have a lot of agency. In fact, she has none. Is there a way to reconcile these two female characters? We’re not sure. But this alien subplot gave us the chance to playfully explore what this story reflects about our world. We’re so excited to share our first production with LA. I’m amazed that we conceived, wrote, and produced the show in this incredibly short time span. But that’s what happens when you engage people who love an adventure, are passionate about live theatre, always willing to play, and are so ridiculously talented! As for the name –Better Than Shakespeare! Well, no we’re not actually better than Shakespeare. But we are definitely a lot of fun. We’re not NOT better than Shakespeare. The cast of Much Ado About Something includes Kate Grabau as Beatrice and Adam Grabau as Benedick, with Evan Smith (The Messenger), Arthur Keng (Don John), Maria Pasquarelli (Leonata), Satchel Dennis (Don Pedro), Seamus Sullivan (Claudio), Giselle Gilbert (Hero), Connor Kelly-Eiding (Ursula, Alien King), Jaemyeong Lee (Dogberry), Dee Dee Stevens (Verges), and Madhuri Shekar (Watchman #1), with live music by Greg Nicolett.